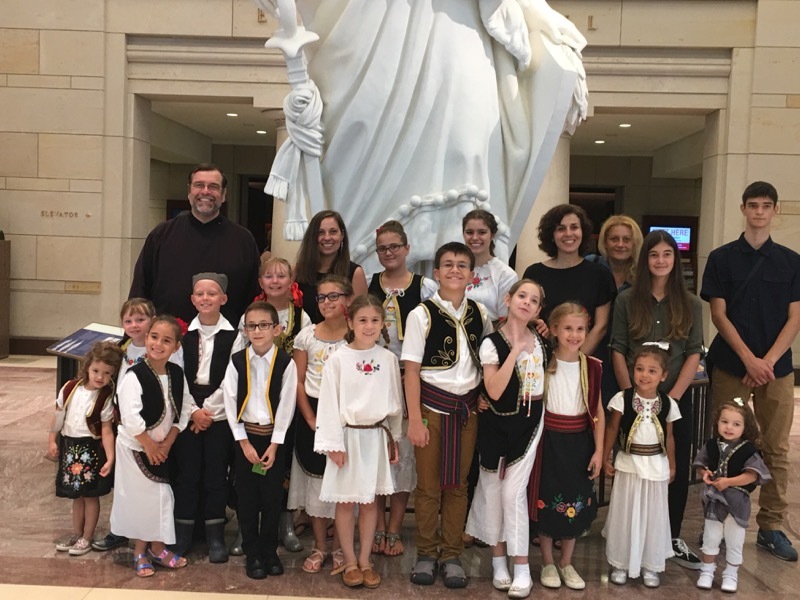 On Wednesday July 25th, 2018, the first day of the celebration commemorating the 100thAnniversary of President Woodrow Wilson’s proclamation for a national day of prayer for the Serbian people, and the flying of the Serbian flag at many buildings in the Capitol, and at the invitation of the Diocesan Director of the Department of Christian Education, Protodeacon Dr. Jovan Anicic, the children of St. Nicholas Serbian Orthodox Church-School of Philadelphia, their families, and representatives of the Kolo Sestara and Executive Board, participated in the activities of the day. The excitement began with everyone meeting at historic Union Station and taking the scenic walk through Senate Park to the Capitol. 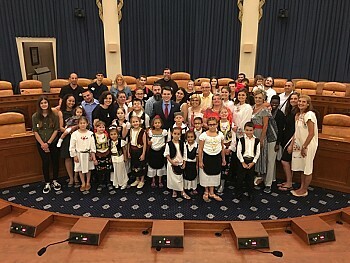 Dressed in traditional Serbian folk costumes (Narodna noshnja), the children and their parents enjoyed a day full of activities which included: attending the opening session of the House of Representatives at which His Grace, Bishop Irinej, delivered an inspiring prayer. Following lunch, the group was lead to the chambers of the Ways and Means Commission, where a group photograph was taken with Representative Brenden Boyle, whose 13thDistrict encompasses Elkins Park, PA., where the church is located. Representative Boyle was pleased to reacquaint himself with Jasna Janikic, to whom he had imparted an award for academic excellence several months earlier. Representative Boyle took the time to answer the children’s inquires, as well as to explain the historic significance of the Ways and Means Commission. Unfortunately, inclement weather prevented the taking of a larger group picture with His Grace on the steps of the Capitol. After meeting Representative Boyle, the group was taken on a tour of the Capitol Rotunda. Amongst the fascinating features of the Rotunda that the children saw were: The Crypt, which was intended to be the final resting place of the first President, George Washington, and the first First Lady, Martha Washington; the original chamber of the House of Representatives, infamous for its audio echo, and the fresco of the “Apotheosis of Washington” on the canopy of the Rotunda. All the participants of the St. Nicholas Church-School of Philadelphia are exceptionally grateful to His Grace, Bishop Irinej, and to Protodeacon Dr. Jovan Anicic for their invitation to be part of this historic celebration.